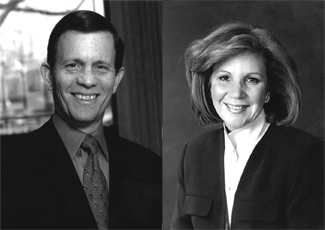 Susie Stern, right, the immediate past chair of the board of UJA-Federation of New York and immediate past president of the National Women's Philanthropy of United Jewish Communities, and Steve Grossman, the past president of the American Israel Public Affairs Committee and former chairman of the Democratic National Committee. In February 2002, after 9/11 and during the worst of the second intifada, very few visitors were coming to Israel. One who did was Hillary Clinton. Visiting Magen David Adom, she met an Israeli soldier in his early 20s named Natan, an Ethiopian Jew who had jumped on a terrorist carrying a bag full of explosives. Natan had miraculously survived the explosion that but for his extraordinary heroism would have killed many Israelis. Deeply moved by his courage, Senator Clinton invited Natan to walk with her in the next Salute to Israel Parade in New York. Months later they did just that. So when Hillary takes the lead in fighting anti-Israel discrimination of all kinds, including her successful advocacy of Magen David Adom’s right to be included into the International Red Cross, it is not some mere political gesture. It is a cause she holds deep in her heart having seen firsthand the struggles of the Israeli people. Her gut-level commitment took her on that same trip to the Sbarro pizzeria in Jerusalem following the suicide bombing there. She then brought the press with her to Hadassah Hospital to visit the victims of that horrible attack and to show the world the terror inflicted upon Israelis. Susie, who accompanied Hillary on that trip, went with Senator Clinton to the hospital and still remembers vividly how Hillary talked privately with victims and their families to guide them on how to make their lives whole after such devastating terror. Susie also was with the senator in 2005, when while inspecting the security fence at Gilo, she looked up at an adjacent apartment pockmarked with bullet holes and landscaped not with flowers and shrubs but with protective sandbags to protect its residents. Hillary has not been content to settle for routine affirmation of Israel’s right to exist as a Jewish state and its right to self-defense. She repeatedly has defended Israel’s security fence as an effective deterrent to the very kind of terrorist bombings she saw in 2002. She also stands with Elie Wiesel in exposing anti-Israel bias and anti-Semitic language in Palestinian schools and textbooks. She has not simply called on the international community to stop Iran from acquiring nuclear weapons. Hillary Clinton voted in the Senate to declare Iran’s Revolutionary Guards a terrorist organization -- notwithstanding the fact that every single one of her Democratic opponents in the presidential campaign subsequently would try to use the vote against her. In her domestic agenda as well, Hillary Clinton has demonstrated a lifetime of leadership on issues of concern to the American Jewish community. Her values embody the Jewish commitment to social and economic justice best articulated in Deuteronomy 16:20, which says "tzedek tzedek tirdo" -- "justice, justice shall thou pursue." That’s why she was the first presidential candidate to propose an economic stimulus plan to fight the looming recession. That’s why she has fought long and hard for health-care reform ensuring that all Americans have the care they need and deserve. That’s why she has fought for equal pay for women and for a woman’s right to choose. That’s why she believes America’s future demands greater educational opportunities for all children and for making a college education more affordable and more accessible. There is a close bond with Israel in this as well. In 1985, while the first lady of Arkansas, Hillary learned about an innovative Israeli preschool education program created by Hebrew University and worked tirelessly to bring the initiative to her state. The Home Instruction Program for Preschool Youngsters, or HIPPY, which guides parents in being their children’s first teachers, was so successful that Hillary worked with the National Council of Jewish Women to implement it in other states. This is Hillary Clinton. This is what she stands for. And this is why Jews and all Americans should join in making her the next president of the United States.